To help your ear make sense of the rootless guide-tone voicings in the left hand, try practicing the chords as written in the lower staff with your right and adding the roots in your left hand. The 7-3-13 voicing of the dominant seventh chord can be heard the intro to the Benny Golson tune ‘Killer Joe’ (played by McCoy Tyner on the original recording) and the intro to ‘Hit That Jive Jack’ as played by Diana Krall on her recording of the tune (based on the Nat King Cole original.) On both of these intros the four-note version of the chord is used, with a 9th added between the 7th and the 3rd. 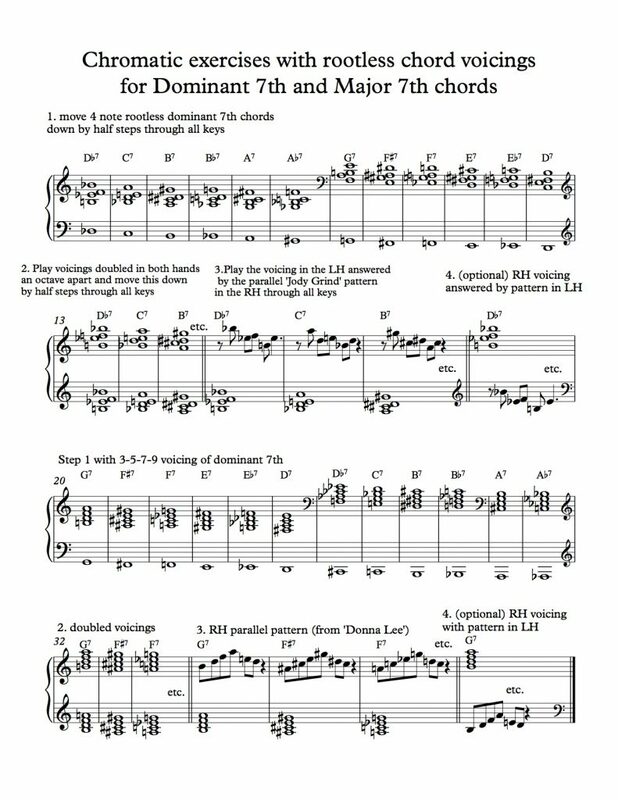 The 3-7-9 voicing of the dominant seventh chord can be heard in the left hand of both Thelonious Monk’s intro to ‘Well You Needn’t’ on the version from the album Genius of Modern Music and Duke Ellington’s intro to ‘In A Mellow Tone’ on the version from the album The Blanton Webster Band. My tune ‘October Blues’ uses both of these patterns over a bassline inspired by the 3/4 blues tunes ‘All Blues’ and a progression borrowed from the Lee Morgan tune ‘Calling Miss Khadija’. 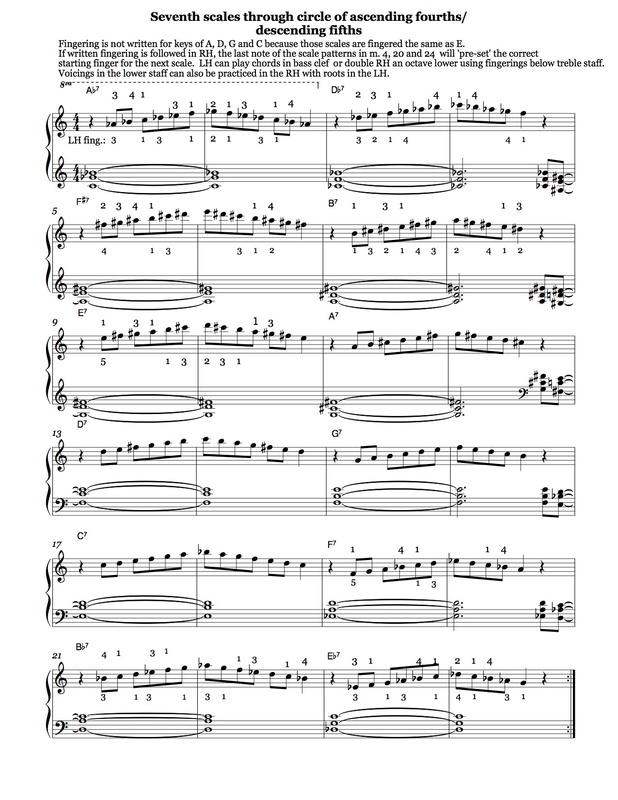 It uses two more patterns based on rootless dominant voicings which can be found in my exercise ‘Jody, Donna, Ko-Ko and Four Brothers’ (and which come from the last two tunes referenced in my composite title, ‘Ko-ko’ by Charlie Parker and ‘Four Brothers’ by Jimmy Giuffre.) This exercise can be found in Part 2 of this post. The bassline is inspired by the Miles Davis tune ‘All Blues’. Rather than using that tune’s continuous bassline, here I combine a single note phrase with a rootless voicing in a four bar pattern that leaves room for a right-hand melodic answer. You could begin your improvised solo by keeping the same left hand pattern and answering it with improvised fills in your right hand. You could also work your way over the course of an improvised solo toward a more continuous bassline ala ‘All Blues’. The scale outline below the tune illustrates one way of practicing seventh scales over a simpler left hand bassline to get your hands in shape to create a melodic conversation between a repetitive and spacious left hand and a more active, improvised right hand. 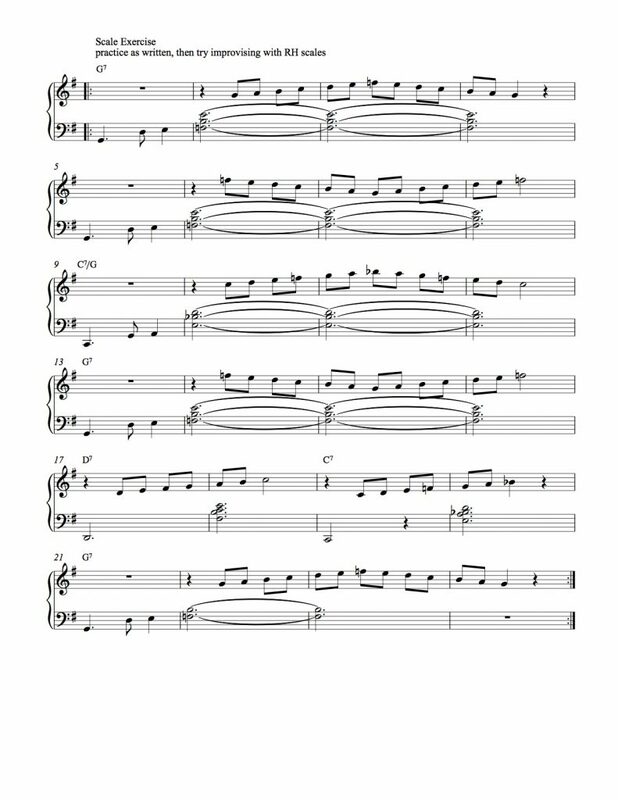 A recording of the tune can be heard here. 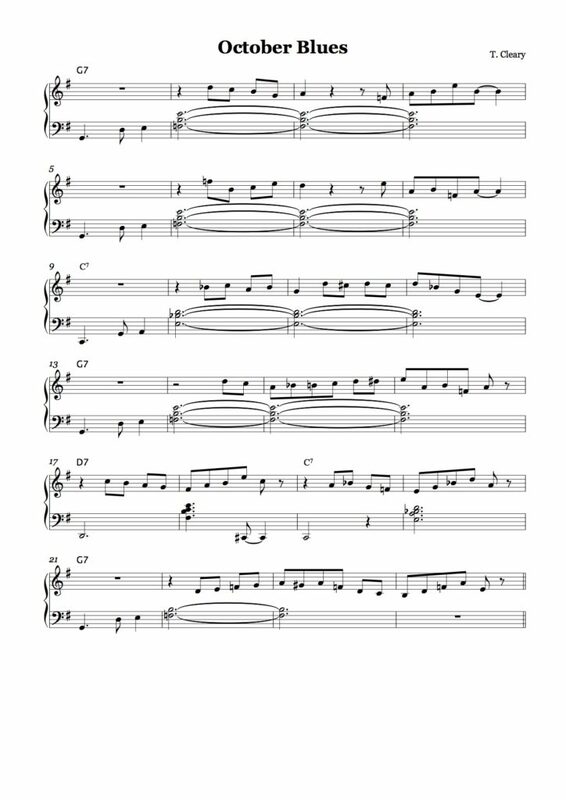 Also, I have posted a two-chorus bass-and-drum accompaniment recording with which you can practice playing through the tune and the scale outline (or the tune and a chorus of solo) in steady time. Also, here is a slower, three-chorus bass and drum accompaniment in case it’s helpful during the practice process. This entry was posted in Improvisation. Bookmark the permalink. Anyway, thank you – it’s very much appreciated.